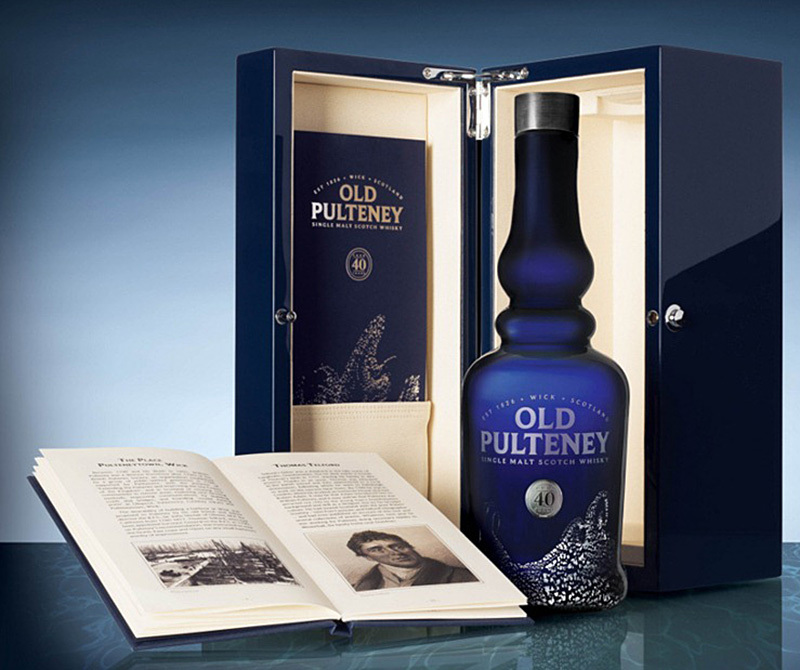 If It's Hip, It's Here (Archives): Old Pulteney 40 Year Old Unveiled In Special Hand Blown and Sterling Silver Bottle With Stone Closure and Blue Lacquered Box. 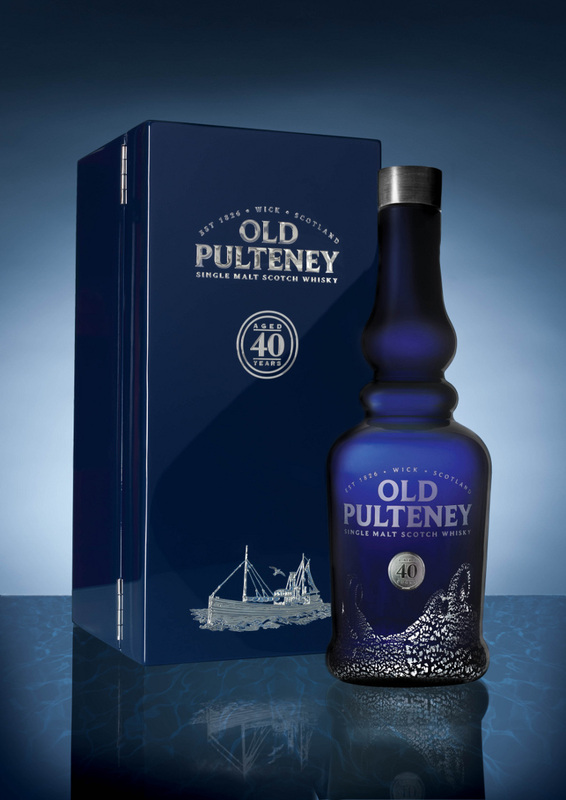 Old Pulteney 40 Year Old Unveiled In Special Hand Blown and Sterling Silver Bottle With Stone Closure and Blue Lacquered Box. 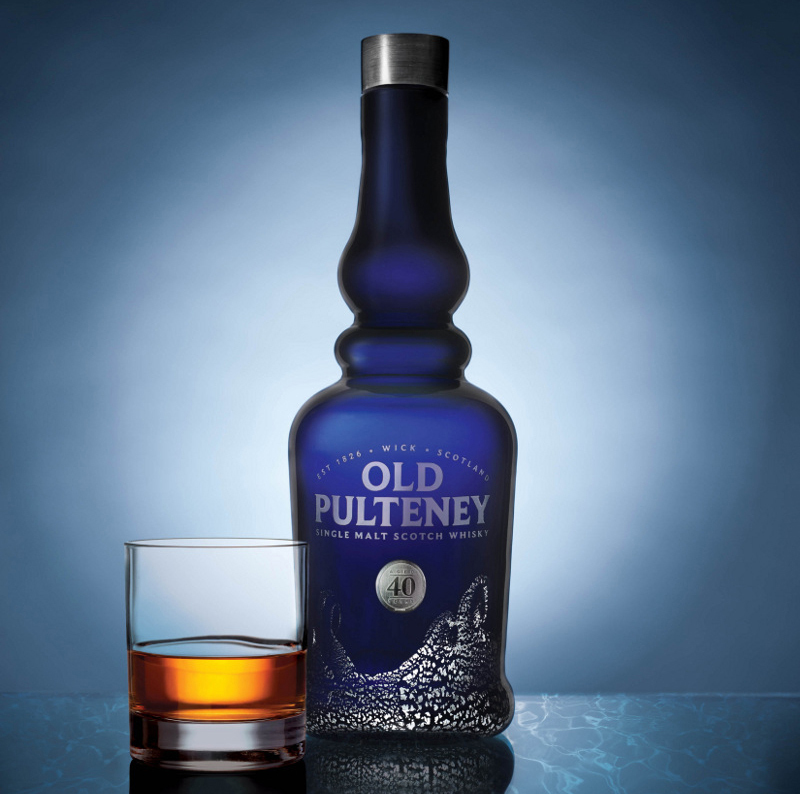 Old Pulteney Single Malt Scotch Whisky has unveiled Old Pulteney 40 Year Old, the oldest official bottling in its line of single malts. Hand blown from melting silica, soda ash and special additions each bottle is then finished with solid silver melted blown across the glass to form a wave pattern. This gives the familiar ‘Smuggler’s Kettle’ Old Pulteney bottle elegance and flair that pay respect to the liquid inside (Old Pulteney Distillery manager Malcolm Waring and Distillery Visitor Center manager Tanya Fraser hand-filled each bottle). 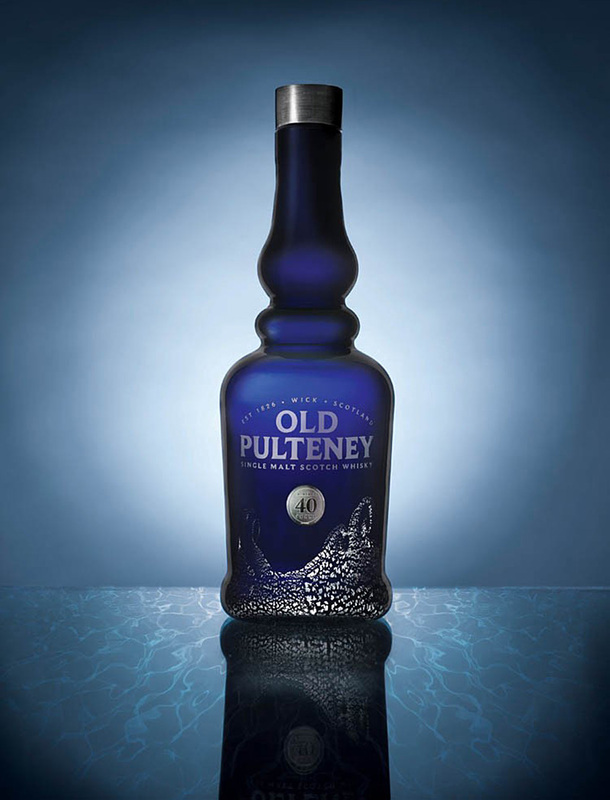 Each bottle of Old Pulteney 40 Year Old is topped with a stone closure whittled, polished, fine-pressure jetted, milled and polished again by the famous local Caithness Stone industries. The bottles are finished with a Scottish hallmarked silver medallion stating the age of the whisky. The high-gloss lacquered wooden box that encases the bottle has the iconic Old Pulteney herring drifter silver-etched into it to complete the stunning presentation. In addition every bottle of Old Pulteney 40 Year Old comes with a hand-signed book by whiskey expert Charles MacLean. Nose: Complex notes of fruit and hay. A touch of calf leather, vanilla, apple peels, musty mahogany and spice. Palate: It’s astonishing how youthful this seems. Certainly it has the complexity. It gives away hints of old, rich oak that come with age, but it’s also gloriously light in body, offering a lovely amount of sweetness. Vanilla notes, nutmeg, cinnamon and pastries develop. Finish: Good length and very spicy. Christmas Cake, honey, cedarwood and chocolate oranges. Cut grass and dark fruits, potpourri and cocoa. Overall: Just brilliant! So much going on and incredibly youthful in terms of sweetness and pep. We loved it! A limited number of bottles of Old Pulteney will be available for purchase in the United States at a retail price of $2,400.